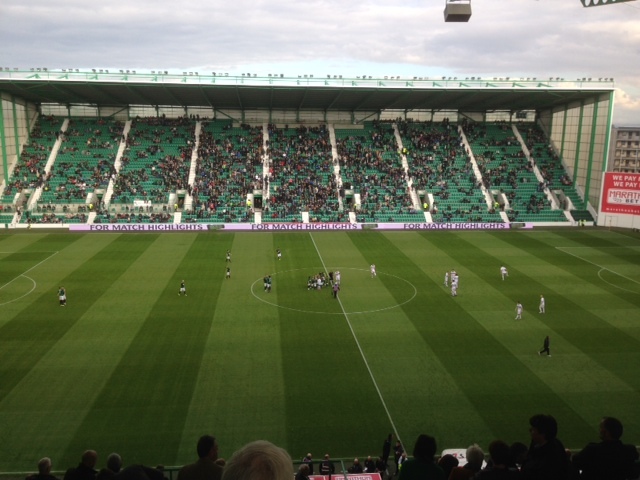 Two atrocious refereeing decisions prevented Hibs from securing all three points against Dumbarton in a game they dominated throughout at Easter Road today. It’s been almost 30 years since the ‘Sons visited Leith on League business, and during that time the Hibs’ fans have witnessed many controversial decisions but few as unbelievable as those given by Barry Cook this afternoon. Head Coach Alan Stubbs made two changes to the starting XI who drew with Raith Rovers last Saturday, with David Gray returning from injury replacing Callum Booth and Dylan McGeouch taking over from Scott Allan. Jason Cummings, Liam Craig and David Gray all went close in the early stages before Mark Oxley was called into action to save a fine strike from Jordan Kirkpatrick. McGeouch then looked to have grabbed the opener with a sensational 30 yard effort but the on loan keeper produced a world class save to tip the ball over the bar with his finger-tips. Cummings was inches away with a header from a Gray cross before Lewis Stevenson’s long range effort caused Rogers problems. Whilst Hibs dominated possession, the ‘Sons always looked dangerous on the break and a long throw from Scott Linton almost set-up Colin Nish, however the former Hibs striker’s glancing header flew inches past the post. Just before the break, Hibs should have taken the lead but were denied by two unbelievably bad decisions by referee Barry Cook. Dominique Malonga controlled the ball inside the Dumbarton penalty area and as he was about to side foot the ball into the net from 8 yards, he was pulled back by Andy Graham. When the referee pointed to the spot, every single person in the stadium assumed that a red card would follow but for some reason only known to himself, Cook chose to ignore the rules of the game and awarded a yellow. Malonga’s poorly struck spot kick was saved by Rogers but the ball squirmed under his body and clearly crossed the line but despite being only a few yards away neither official awarded a goal, much to the disgust of the Hibs’ fans. His performance did not improve in the second half, but as the supporters showed their displeasure, the referee clearly wanted to show that he was unaffected by the criticism and awarded every debatable decision to Dumbarton. In the 49th minute, Jordon Forster and Scott Robertson both suffered head knocks which required treatment yet to the surprise of the fans neither was asked to leave the field. Liam Craig then went close before substitute Paul Heffernan had the ball in the net but was judged to be in an offside position. With 9 minutes remaining, the referee missed a blatant handball by a Dumbarton defender inside the box and at the point the furious Hibs fans accepted that this was not to be their day. A Cummings shot was deflected wide before Matthew Kennedy’s rising shot was tipped over the bar. Despite the fact that the referee had continued to point at his watch whenever the Dumbarton players wasted time, he only added on three minutes and blew his whistle before Hibs could take one last corner.After the game Dumbarton manager Ian Murray admitted that the ball had crossed the line and Hibs Head Coach Alan Stubbs diplomatically suggested that the officials have had better days. Hibernian: Oxley, Gray, Hanlon, Fontaine (Kennedy 58’), Forster, Robertson, Craig (Allan 77’), Stevenson, McGeouch, Malonga (Heffernan 68’), Cummings. Substitutes not used: Perntreou, Stanton, Handling, Booth. Dumbarton: Rodgers, van Zanten, Linton, Graham, Gilhaney, Agnew (McLaughlin 90’), Nish, Megginson (MacDonald 71’), Kirkpatrick, Taggart, Flemming (Campbell 77’). Substitutes not used: Ewings, Mair, Murray, McDougal.